Calculate emf, current, and magnetic fields using Faraday’s Law. This relationship is known as Faraday’s law of induction. The units for emf are volts, as is usual. Figure 1. (a) When this bar magnet is thrust into the coil, the strength of the magnetic field increases in the coil. The current induced in the coil creates another field, in the opposite direction of the bar magnet’s to oppose the increase. This is one aspect of Lenz’s law—induction opposes any change in flux. (b) and (c) are two other situations. Verify for yourself that the direction of the induced Bcoil shown indeed opposes the change in flux and that the current direction shown is consistent with RHR-2. Make a sketch of the situation for use in visualizing and recording directions. Determine the direction of the magnetic field B. Determine whether the flux is increasing or decreasing. Now determine the direction of the induced magnetic field B. It opposes the change in flux by adding or subtracting from the original field. Use RHR-2 to determine the direction of the induced current I that is responsible for the induced magnetic field B. The direction (or polarity) of the induced emf will now drive a current in this direction and can be represented as current emerging from the positive terminal of the emf and returning to its negative terminal. For practice, apply these steps to the situations shown in Figure 1 and to others that are part of the following text material. There are many applications of Faraday’s Law of induction, as we will explore in this chapter and others. At this juncture, let us mention several that have to do with data storage and magnetic fields. A very important application has to do with audio and video recording tapes. A plastic tape, coated with iron oxide, moves past a recording head. 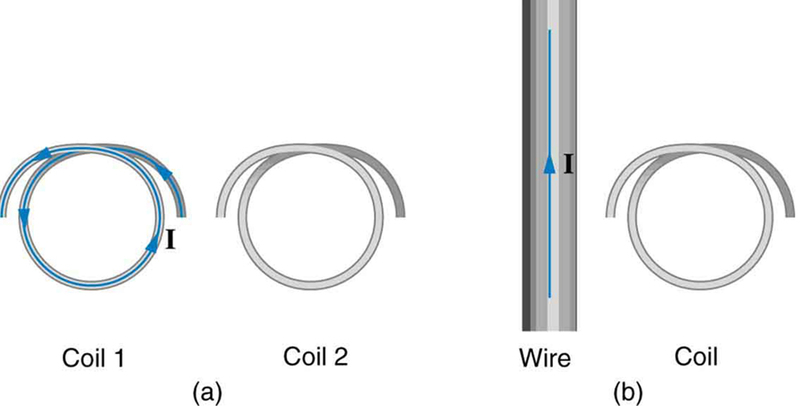 This recording head is basically a round iron ring about which is wrapped a coil of wire—an electromagnet (Figure 2). 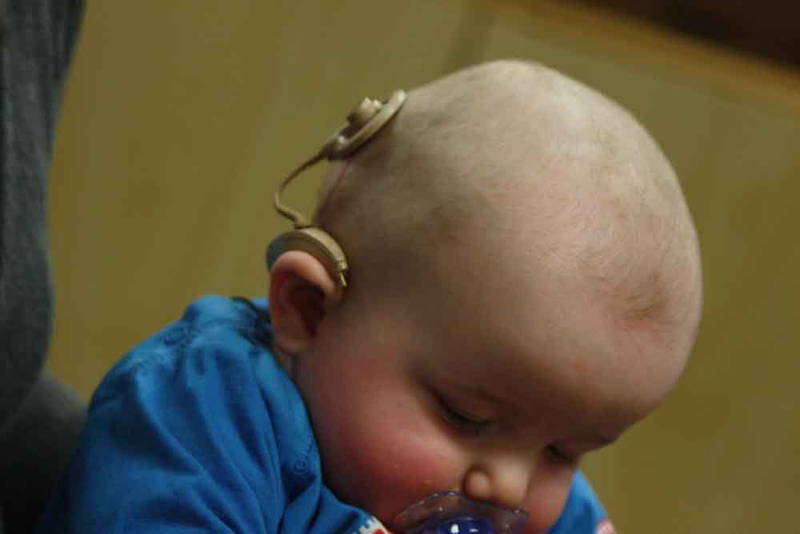 A signal in the form of a varying input current from a microphone or camera goes to the recording head. These signals (which are a function of the signal amplitude and frequency) produce varying magnetic fields at the recording head. As the tape moves past the recording head, the magnetic field orientations of the iron oxide molecules on the tape are changed thus recording the signal. In the playback mode, the magnetized tape is run past another head, similar in structure to the recording head. The different magnetic field orientations of the iron oxide molecules on the tape induces an emf in the coil of wire in the playback head. This signal then is sent to a loudspeaker or video player. Similar principles apply to computer hard drives, except at a much faster rate. Here recordings are on a coated, spinning disk. Read heads historically were made to work on the principle of induction. However, the input information is carried in digital rather than analog form – a series of 0’s or 1’s are written upon the spinning hard drive. Today, most hard drive readout devices do not work on the principle of induction, but use a technique known as giant magnetoresistance. (The discovery that weak changes in a magnetic field in a thin film of iron and chromium could bring about much larger changes in electrical resistance was one of the first large successes of nanotechnology.) Another application of induction is found on the magnetic stripe on the back of your personal credit card as used at the grocery store or the ATM machine. This works on the same principle as the audio or video tape mentioned in the last paragraph in which a head reads personal information from your card. Another contemporary area of research in which electromagnetic induction is being successfully implemented (and with substantial potential) is transcranial magnetic simulation. A host of disorders, including depression and hallucinations can be traced to irregular localized electrical activity in the brain. In transcranial magnetic stimulation, a rapidly varying and very localized magnetic field is placed close to certain sites identified in the brain. Weak electric currents are induced in the identified sites and can result in recovery of electrical functioning in the brain tissue. Lenz’s law is a manifestation of the conservation of energy. The induced emf produces a current that opposes the change in flux, because a change in flux means a change in energy. Energy can enter or leave, but not instantaneously. Lenz’s law is a consequence. As the change begins, the law says induction opposes and, thus, slows the change. In fact, if the induced emf were in the same direction as the change in flux, there would be a positive feedback that would give us free energy from no apparent source—conservation of energy would be violated. Example 1: Calculating Emf: How Great Is the Induced Emf? Calculate the magnitude of the induced emf when the magnet in Figure 1(a) is thrust into the coil, given the following information: the single loop coil has a radius of 6.00 cm and the average value of (this is given, since the bar magnet’s field is complex) increases from 0.0500 T to 0.250 T in 0.100 s.
While this is an easily measured voltage, it is certainly not large enough for most practical applications. More loops in the coil, a stronger magnet, and faster movement make induction the practical source of voltages that it is. Play with a bar magnet and coils to learn about Faraday’s law. Move a bar magnet near one or two coils to make a light bulb glow. View the magnetic field lines. A meter shows the direction and magnitude of the current. View the magnetic field lines or use a meter to show the direction and magnitude of the current. You can also play with electromagnets, generators and transformers! when flux changes by in a time . If emf is induced in a coil, is its number of turns. The minus sign means that the emf creates a current and magnetic field that oppose the change in flux —this opposition is known as Lenz’s law. 1: A person who works with large magnets sometimes places her head inside a strong field. She reports feeling dizzy as she quickly turns her head. How might this be associated with induction? 2: A particle accelerator sends high-velocity charged particles down an evacuated pipe. Explain how a coil of wire wrapped around the pipe could detect the passage of individual particles. Sketch a graph of the voltage output of the coil as a single particle passes through it. 1: Referring to Figure 5(a), what is the direction of the current induced in coil 2: (a) If the current in coil 1 increases? (b) If the current in coil 1 decreases? (c) If the current in coil 1 is constant? Explicitly show how you follow the steps in the Problem-Solving Strategy for Lenz’s Law. 2: Referring to Figure 5(b), what is the direction of the current induced in the coil: (a) If the current in the wire increases? (b) If the current in the wire decreases? (c) If the current in the wire suddenly changes direction? Explicitly show how you follow the steps in the Problem-Solving Strategy for Lenz’s Law. 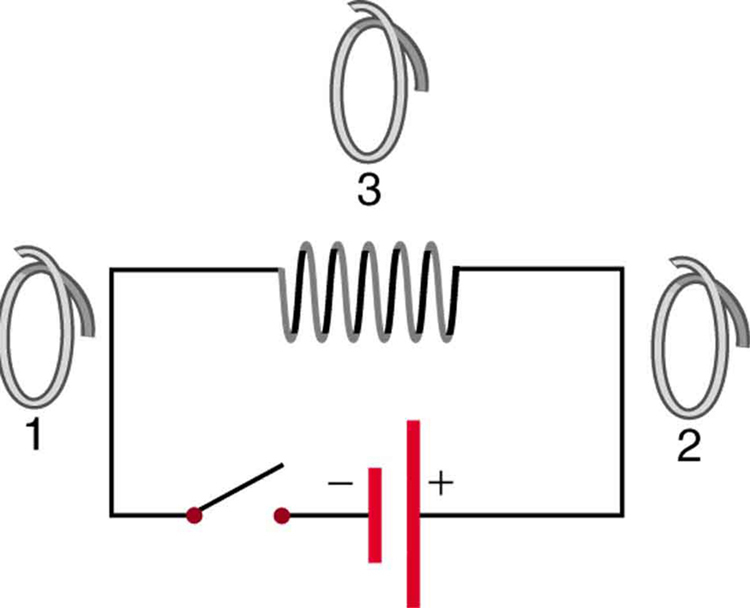 3: Referring to Figure 6, what are the directions of the currents in coils 1, 2, and 3 (assume that the coils are lying in the plane of the circuit): (a) When the switch is first closed? (b) When the switch has been closed for a long time? (c) Just after the switch is opened? 4: Repeat the previous problem with the battery reversed. 5: Verify that the units of are volts. That is, show that .
. It is stretched to have no area in 0.100 s. What is the direction and magnitude of the induced emf if the uniform magnetic field has a strength of 1.50 T? 7: (a) An MRI technician moves his hand from a region of very low magnetic field strength into an MRI scanner’s 2.00 T field with his fingers pointing in the direction of the field. Find the average emf induced in his wedding ring, given its diameter is 2.20 cm and assuming it takes 0.250 s to move it into the field. (b) Discuss whether this current would significantly change the temperature of the ring. Referring to the situation in the previous problem: (a) What current is induced in the ring if its resistance is ? (b) What average power is dissipated? (c) What magnetic field is induced at the center of the ring? (d) What is the direction of the induced magnetic field relative to the MRI’s field? 9: An emf is induced by rotating a 1000-turn, 20.0 cm diameter coil in the Earth’s magnetic field. What average emf is induced, given the plane of the coil is originally perpendicular to the Earth’s field and is rotated to be parallel to the field in 10.0 ms? 10: A 0.250 m radius, 500-turn coil is rotated one-fourth of a revolution in 4.17 ms, originally having its plane perpendicular to a uniform magnetic field. (This is 60 rev/s.) 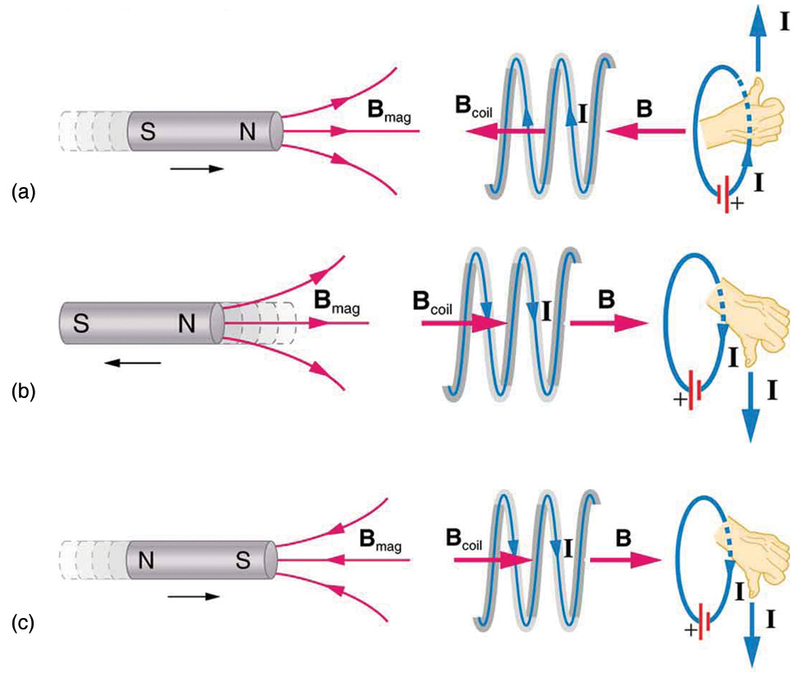 Find the magnetic field strength needed to induce an average emf of 10,000 V.
Approximately how does the emf induced in the loop in Figure 5(b) depend on the distance of the center of the loop from the wire? (a) A lightning bolt produces a rapidly varying magnetic field. If the bolt strikes the earth vertically and acts like a current in a long straight wire, it will induce a voltage in a loop aligned like that in Figure 5(b). What voltage is induced in a 1.00 m diameter loop 50.0 m from a lightning strike, if the current falls to zero in ? (b) Discuss circumstances under which such a voltage would produce noticeable consequences. (b) As a lower limit on the ring, estimate R = 1.00 mΩ. The heat transferred will be 2.31 mJ. This is not a significant amount of heat. 23.2 Faraday’s Law of Induction: Lenz’s Law by OpenStax is licensed under a Creative Commons Attribution 4.0 International License, except where otherwise noted.